The Dhammayangyi Temple in Bagan, Myanmar is largest of all temples in the Burmese capital and it is totally worth the hype. 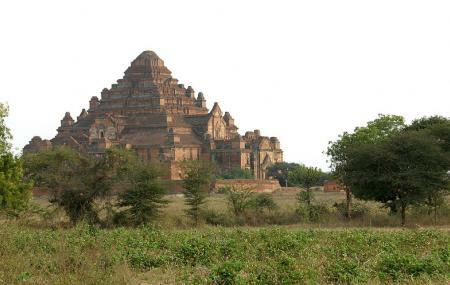 Built during the reign of King Narathu, this one is the widest temple in Bagan and is also a popular tourist destination. The temple has Buddha statues with the faces made up of gold. Even though you can’t enter the interiors of the temple, but still you can wander through the corridors and click stunning pictures. How popular is Dahmmayan Gyi Phaya? People normally club together Manuha Temple and Sulamani Guphaya Temple while planning their visit to Dahmmayan Gyi Phaya. The biggest temple in Bagan with interesting story. King Narathu built the temple for his sin of killing his father and brother. It is a picturesque place in Bagan and there is a puppet shop with many puppets hanging on the tree. It's also a good place to take pictures. One of the beautiful but said to be the tallest of the archaeological set of Buddhist Pagoda in Bagan. The renovation work is in progress. The entire building of the Pagoda could be captured only on climbing an elevated mound at the Fringe of the complex.the best age can be obtained at the dawn when the Sun rays are not in higher degree ! One of the most iconic and largest Buddha temple in Bagan, it built since year 1167.